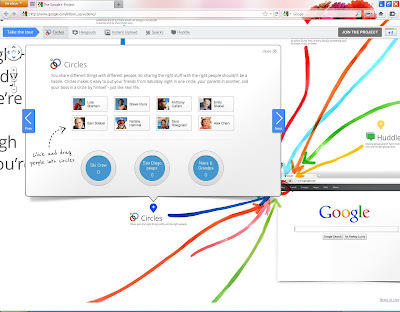 Google's Answer to FaceBook; The Google Plus Project. 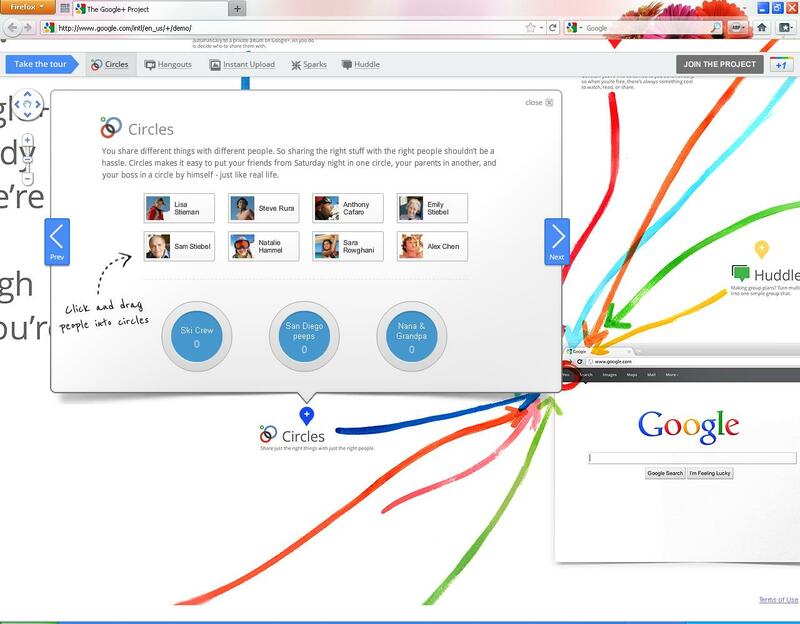 In a monumental announcement rivaling Microsoft’s release of its Office 365 cloud computing service, Google has announced today the launch of its answer to Facebook, a social networking service called Google Plus. Google took its biggest leap yet onto Facebook's turf Tuesday, introducing a social networking service called the Google(PLUS) project, which happens to look very much like Facebook. Google is betting that its approach to privacy and extensive controls over who you share information with on the network will set Google Plus apart. The service revolves around a concept of “circles” You can create as many circles as you like, for whatever categories you want: for example family, co-workers or biking friends. Above the circles are a slew of thumbnail images of friends and contacts which Google suggests you might want in your social network. To add a person to one of your groups, drag the name into a circle. If you decide to remove someone from a circle, you simply drag their image out of the circle, at which point the image will explode into a cloud of smoke – one of several whimsical touches in Google+. To use Google+ you need to create a Google profile. At the very minimum, Google requires that you use your real name and include a photo. Beyond that, you can furnish the profile with as much, or as little, detail about yourself as you want. You can control how much of your profile is visible to other folks on the network: your name and occupation for some folks; relationship status for others. Type a person’s name into a box, and you can see what your profile looks like through their eyes. In a sense, Google+ combines the Facebook and Twitter models of social networking: You can have friends in your social network with whom you share information, and you can also simply follow certain people, say a movie critic who you don’ t know personally, a la Twitter. Actual dll file is missing from your hard disk. The Default value in the [Boot Loader] section of the Boot.ini file is missing or invalid. Windows XP is not installed in the location specified in the Boot.ini file. The partition path in the Boot.ini file is not set correctly. Use the Windows XP CD-ROM to start your computer. When you receive the message to press R to repair Windows by using the Recovery Console, press the R key. Select the Windows installation that you want, and then type the administrator password when prompted. go to your <CD DRIVE>:i386 path. Now Type bootcfg /rebuild, and then press ENTER. [Leave this field blank, and then press ENTER]. After you perform the preceding steps, restart the computer, and then select the first item on the boot menu. This should allow Windows XP to start normally. After Windows XP has successfully loaded, the Boot.ini can be modified to remove the incorrect entry. 7th June, 2011.. new stable release of Chrome brings improvements in security, privacy, and graphics to Chrome’s users. However, improvements to the browser's graphics capabilities will be more noticeable to users. With added support for hardware-accelerated 3D CSS, Web applications using 3D effects will be "snazzier," Google says. So, what does that mean? With 3D CSS, which is now available in Google Chrome, the browser has access to the computer's hardware to speed up the experience of viewing 3D effects. 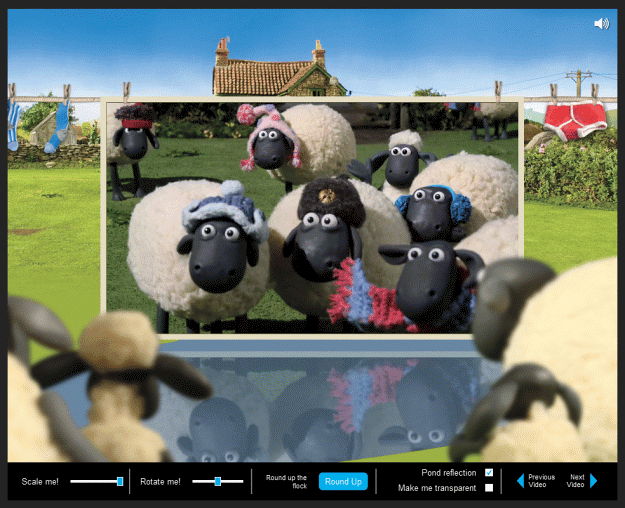 To see what this looks like in action, Google offers a link to a Chrome experiment called "Shaun of the Sheep." This cute cartoon (which works only in Chrome), demonstrates how 3D CSS lets you rotate a video, scale it up and down, turn the reflection on and off and activate a rotating carousel of videos. In addition to 3D CSS Transforms, the experiment also takes advantage of hardware-accelerated HTML5 and the new audio-video format, WebM, open-sourced by Google last year. Also new in this release are enhancements to Google's Safe Browsing technology, which has now been improved to warn you before you download certain malicious files. Chrome has improved this detection process so that it can detected the malicious files without having ever seen what URL you visited. More details on that process are described here. Google's close relationship with Adobe has allowed it to integrate Flash LSO (local shared objects) deletion right into the Web browser, so you can better manage your online privacy. These objects, often referred to as "Flash cookies" are similar to their "browser cookies" counterparts, in that they contain information used to customize your Web browsing experience, or hold data like your login info for a website. Unfortunately, Flash cookies are harder to delete than regular cookies - until now, Chrome users were only able to manage or delete cookies using this online tool. Now, you'll be able to delete the cookies from your browser Settings. Just click on the Wrench, go to Tools, Clear Browsing Data and select "Delete cookies and other site and plug-in data." What's new in normal use? Google Chrome 12 also reverts back the new logo that was introduced earlier and switches back to the older one. If you would like to experience the excitement of the 3D CSS, In Chrome 12, 3D CSS gets some love, and if you're running Windows Vista or Mac OS X 10.6 or above, there is a special Google Experiment titled "Shaun the Sheep", which allows you to rotate and scale the video as well as enable the reflection.